The Curtis Publishing Company, founded in 1891 in Philadelphia, Pennsylvania, became one of the largest and most influential publishers in the United States during the early 20th century. 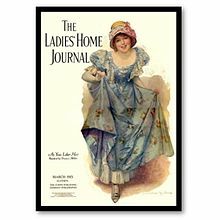 The company's publications included the Ladies' Home Journal and The Saturday Evening Post, The American Home, Holiday, Jack & Jill, and Country Gentleman. In the 1940s, Curtis also had a comic book imprint, Novelty Press. The Curtis Publishing Company was founded in 1891 by publisher Cyrus H. K. Curtis, who published the People's Ledger, a news magazine he had begun in Boston in 1872 and moved to Philadelphia in 1876. The city was already a major publishing center. Curtis also established the Tribune and Farmer in 1879. From a brief women's supplement, his wife Louisa Knapp Curtis developed a women's section and the Ladies' Home Journal, which she edited from 1883 to 1889. Curtis Publishing created a market research division in 1911 under Charles Coolidge Parlin. The goal of the division was to understand their customers and was one of the first market research firms. Curtis reported record earnings of $21 million on $84 million in revenue in 1929. Curtis spun off their market research division, National Analysts, as an independent organization to provide market research services to business and government. In 1946, Curtis Publishing bought and launched Holiday magazine, focusing on travel and photo essays. The advent of television in the late 1940s and early 1950s competed for people's attention and eroded the popularity of general-interest periodicals such as the Post and the Journal. The New York Times reported that both the finance markets and Madision Avenue were watching Curtis Publishing's efforts to save itself after a financial decline. The reason the New York Times gave for the attention, "the status of the venerable Curtis empire, the colorful cast of characters directing the comeback attempt, the vast sums of money at stake. In addition, Curtis's troubles seemed to reflect the difficulties encountered by the mass magazines industry as a whole in adjusting to an era dominated by the spiraling growth of television." It wasn't until 1961 and 1962 that the issues became visible in lost revenue. In 1961 Curtis Publishing's president Robert A. MacNeal announced that the company had lost money for the first time in the more than seven decades since its incorporation. The company's revenues showed a loss of $4,194,000 on $178.4 million in revenue that year. The next year in 1962, company had total revenues of $149 million and a loss of $18.9 million. Curtis management went to Serge Semenenko who had helped the Hearst Corporation to reorganize and Semenenko arranged for a six-bank syndicate to loan $10.5 million to Curtis. Many experts noted that there were a number of issues tied to the decline of Curtis. 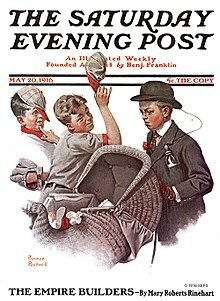 Many of their competitors such as Time, Inc. and McCall Corporation had diversified while Curtis remained focused on their two key periodicals--Saturday Evening Post and Ladies' Home Journal. Their other magazines -- Holiday, Jack & Jill, and American -- simply could not make up the lost revenue of the main periodicals. 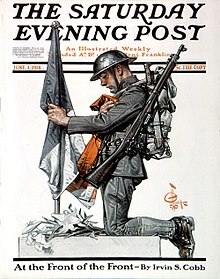 The Saturday Evening Post was no longer the top mass market periodical, having been surpassed by Life magazine in 1942 and then spiraling into a ten-year decline in advertising revenue after World War II. The Ladies' Home Journal lost their position to McCall's in 1960. Other experts cited that the two flagship magazines "simply grew old." They "fell into a formula that tended to attract older readers rather than the young married couples that advertisers wanted to reach." They also stayed away from some of the more aggressive circulation promotion techniques used by their competitors. Matthew J. Culligan, President of Curtis, cited another downfall in the use of its own presses and its own paper. Culligan said, "This sort of self-sufficiency is fine in good times but it imposes an intolerable burden when business goes bad." They had also failed to follow the model of some of their competitors by diversifying into television, news magazines or book publishing after World War II. Meanwhile the company made a number of editorial and executive changes at their magazine properties. Ben Hibbs, the editor of the Saturday Evening Post since 1942, retired, as did Bruce and Beatrice Gould of the Ladies' Home Journal (editors since 1935). The Post attempted to reinvent itself with more controversial articles and flashy graphics. Two editors--Robert Fouss (Saturday Evening Post) and Curtiss Anderson (Ladies' Home Journal) quickly came and went. Ted Patrick, editor of Holiday magazine, said that Darwinian cost-cutting would be the kiss of death to Holiday. Curtis received another loan of $5.5 million in 1964 to be used to make investments in new editorial properties. Perfect Film loaned the company $5 million in 1968 at the request of Curtis's primary loan holder, First National Bank of Boston, to extend its loans. Curtis sold its Philadelphia headquarters to real estate developer John W. Merriam for $7.3 million to pay off most of the First National loan; it leased half of the building back for its operations. In 1968, Curtis Publishing sold the Ladies' Home Journal and The American Home to Downe Communications for $5.4 million in stock; it sold the stock for operating revenue. The list of six million Post subscribers were sold to Life for cash, a $2.5 million loan, and a contract with Curtis' circulation and printing services subsidiaries. Despite these attempts to revive the Saturday Evening Post, failing to find a purchaser for the magazine, Curtis Publishing shut down the magazine in 1969. In March 1969, the Federal Trade Commission directed Curtis to offer cash refunds for unfulfilled portions of Post subscriptions. Perfect Film purchased Curtis Circulation Company that same year. In 1976, The Saturday Evening Post Society was spun off from Curtis to publish its flagship magazine. U.S. Kids was formed, which publishes their portfolio of children's magazines. Curtis Publishing still exists in the 21st century as a licensing firm that licenses their magazine covers and artwork including 4,000 images from over 500 artists. As Curtis Licensing, they license advertisement images as well as to companies creating and selling memorabilia. The Norman Rockwell and other images have been used on products such as fine art and prints, greeting cards, figurines, and other collectibles. Front facade of The Curtis Building on S. 6th St. In 1910 the company built its headquarters building at the intersection of South Sixth and Walnut streets, about 200 feet (61 m) southwest of Independence Hall. The building was designed by Edgar Viguers Seeler (1867-1929) in the Beaux Arts style. The square-block building stretches from South Sixth to South Seventh Street east to west, and from Sansom Street to Walnut Street north to south. The building was renovated in 1990 by Oldham and Seltz and John Milner Associates. The interior of the building features a terraced waterfall and fountain, an atrium with faux-Egyptian palm trees, and the 15-by-49-foot (4.6 m × 14.9 m) glass-mosaic Dream Garden (1916) designed by Maxfield Parrish and made by Louis Tiffany and Tiffany Studios. 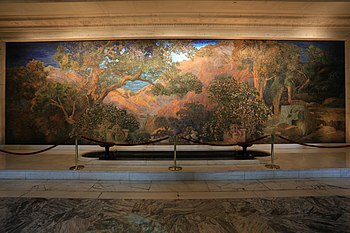 The glass-mosaic work was commissioned by Edward Bok, who was the Senior Editor of the company at the time. It was exhibited at Tiffany Studios in New York City for a month before being installed in the building's lobby, which took six months. The mosaic is made of 100,000 pieces of hand-fixed Favrile glass in 260 different colors. In 1998, the mosaic was sold to casino owner Steve Wynn, who intended to move it to one of his casinos in Las Vegas. This was blocked by local historians and art lovers, who raised $3.5 million to purchase the work and prevent its being moved from the city. The money was provided by the Pew Charitable Trusts to the Pennsylvania Academy of the Fine Arts, which now owns the work. ^ a b c d "Curtis Publishing - The Art of Licensing". www.curtispublishing.com. Retrieved 2018-06-14. ^ "Our History | NAXION | Research > Consulting". www.naxionthinking.com. Retrieved 2018-06-21. ^ a b c d e f g h i j k l m n o p "Decline of Key Magazines Rocked Curtis Empire; Publisher, Reset by Financial and Management Woes, Still Fighting Losses". The New York Times. 1964-10-09. ISSN 0362-4331. Retrieved 2018-06-11. ^ Callahan, Michael (May 2013). "The Visual and Writerly Genius of Holiday Magazine". Vanity Fair. Retrieved 2018-05-30. ^ Bedingfield, Robert E. (December 21, 1964). "Curtis Assured of Bank Credits". The New York Times. Retrieved 2018-06-12. ^ "Magazines: New Man for Curtis". Time. May 3, 1968. Retrieved 6 August 2011. ^ Bedingfield, R. E. "Curtis Publishing Sells 2 Magazines; Downe Paying $5.4-Million in Stock", The New York Times, August 15, 1968, Business and Finance section, p. 54. ^ "Too Few Believers." Time. Friday, Aug. 23, 1968. ^ a b Welles, Chris (Feb 10, 1969). "Post-Mortem". New York Magazine. pp. 32–36. Retrieved 5 August 2011. ^ "FTC Orders Refunds By Curtis". Tri City Herald. March 20, 1969. p. 21. Retrieved 23 September 2011. ^ "Curtis Licensing - The Art of Licensing". www.curtispublishing.com. Retrieved 2018-06-17. ^ Walters, Patrick (December 21, 2006). "Eakins painting to stay in Philadelphia". The Star. Toronto. Retrieved April 30, 2010. Wikimedia Commons has media related to Curtis Publishing Company Building. The Curtis Publishing Company Records, including financial records, advertising standards, magazines and newspaper clippings, are available for research use at the Historical Society of Pennsylvania. The Frederic W. Goudy Collection at the Library of Congress contains illustrative advertising posters for the Curtis Publishing Company.